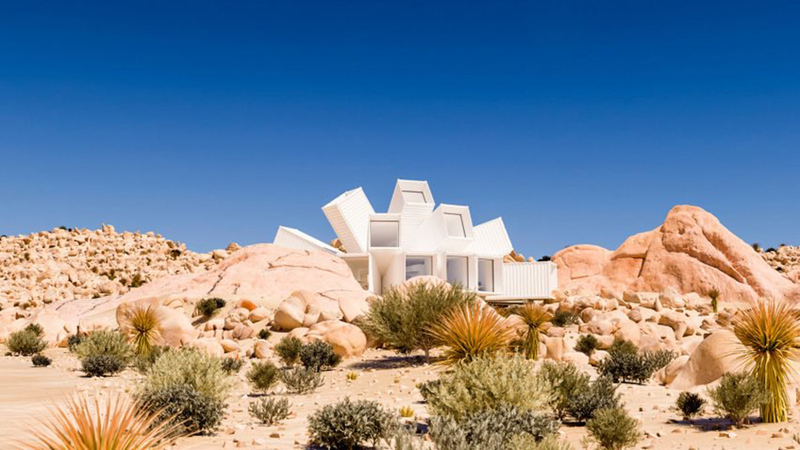 The Joshua Tree Residence by James Whitaker appeared on Dezeen and nearly every other design blog at the end of September. 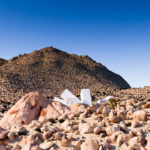 Consisting of splayed shipping containers painted white and placed among rocks near Joshua Tree in California, the form could easily be mistaken for a sculpture. The articles revealed that Whitaker was relocating a design for a studio space in Germany that had been widely publicized in 2015. The client in Germany “had originally requested a design using shipping containers to reduce its cost, which formed the basis for the architect’s suggestion to cluster the metal boxes in a radial composition.” But the client’s business closed, so the studio never got built. Two years later, the design is back. In 2017, the splayed container complex has changed from black to white and has been re-located to an extremely rocky site “in a gully formed by years of stormwater.” There is no longer any mention of this being a low-cost scheme; it is clearly an expensive holiday home for a rich client. After all, you can’t just cut pieces out of shipping containers and bolt them together into any shape you’d like if you expect them to stand up: this is a fully custom steel building. 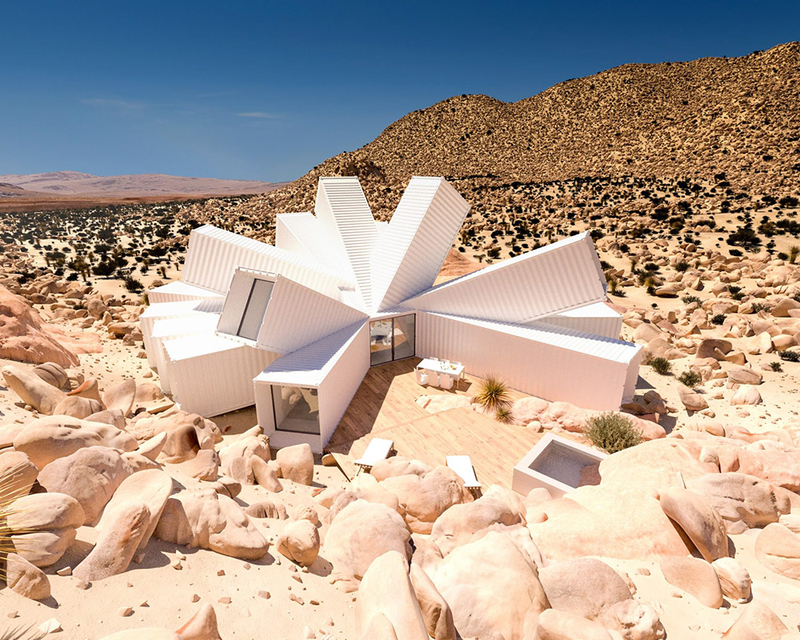 While it would be easy to criticize yet another shipping container project on the basis of it being made out of shipping containers, what is more remarkable is the publicity one can get for renderings of a structure that has no connection to its site or program. At the scale of a single family home, especially a custom one for a wealthy client, one might expect some connection between the building and its site. Whether it be views, access, climate or context, designing a home like this is an opportunity to craft it for its location, particularly when the location is as extreme and awe-inspiring as the desert. The architecture itself does little to go beyond the moment captured in the visualization. While the plan has been adjusted slightly from the original design for the German site, the same basic parti is in place. Awkward seven foot wide rooms are arranged around a central core, with every space facing outwards to a window that fills the frame of the container. 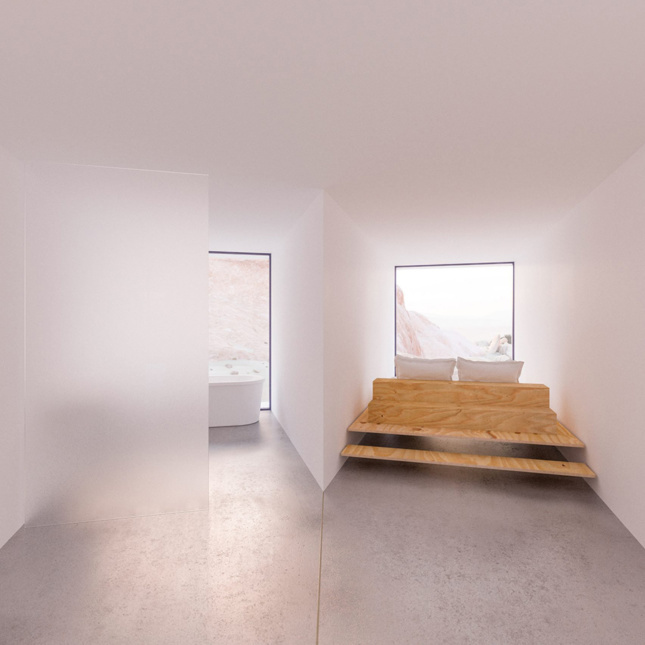 Beds fit the width of the bedrooms facing the landscape. One can only imagine the client climbing over the plywood headboard each evening to turn in. 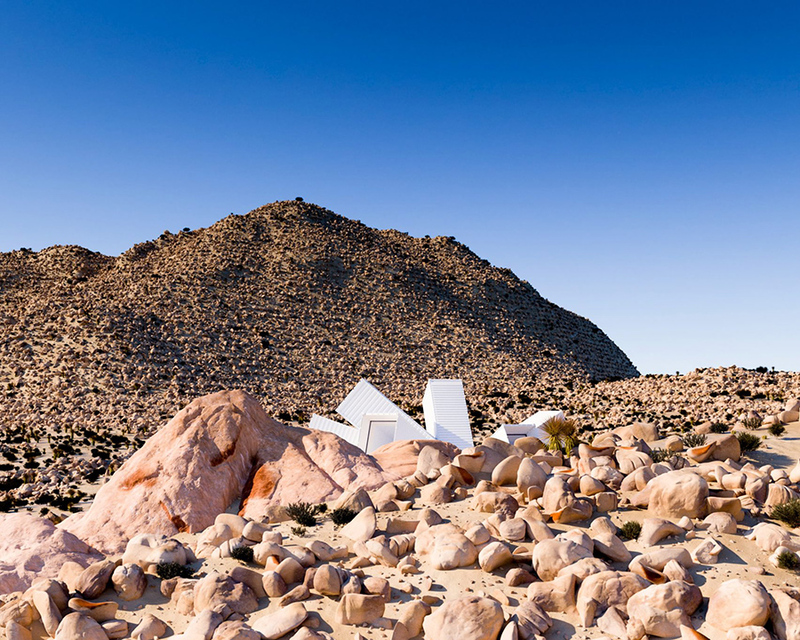 The renderings are striking, depicting an aggressively sculptural, formal object in the extreme climate of the California desert. On that account, Whitaker is successful. But if this is to be evaluated as a piece of architectural design, I am much less convinced. Maybe it will never get built, or maybe every few years, the renderings will pop up with the building located in an entirely different context under exciting new headlines: “Splayed container building houses underwater hotel,” or “Clustered containers make Antarctic research station.” This might be the most interesting option.